Draynor Village is a well known village, consisting of free-to-play and pay-to-play parts. Draynor is popular because of its willow trees, market, and even it's role in a number of quests. 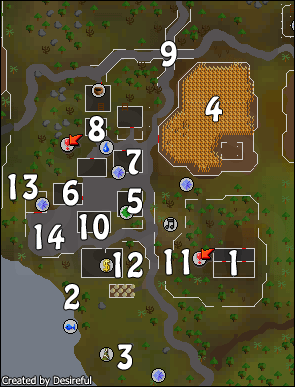 Use Lumbridge or Home teleport and walk. Teleport using a charged Amulet of Glory (Members only). 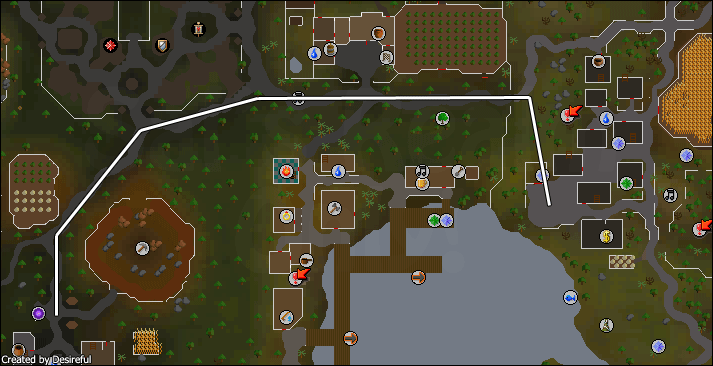 Teleport to Cabbage Patch using Explorer Ring(3) and walk from there. 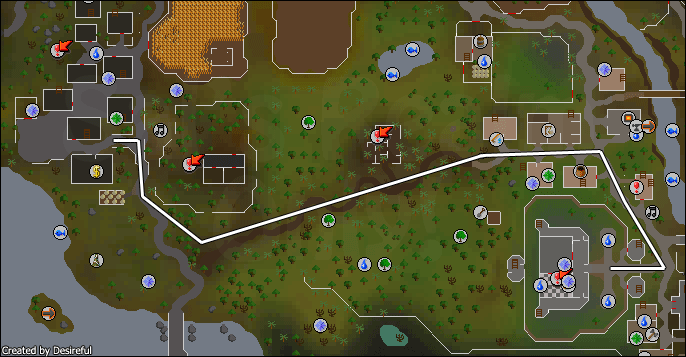 You can either teleport to Falador or your own House and walk there. 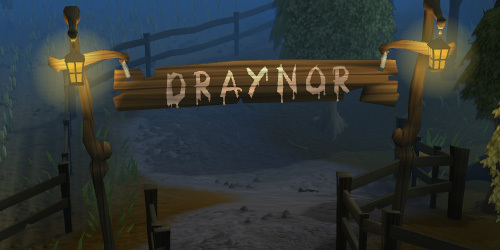 The jail is to the north of Draynor Village, but still considered one of the roots from Draynor Village. At the jail, you will find several NPCs. There is Lady Keli, some level 26 guards who just feel the need for fighting, Prince Ali, Joe, some level 2 goblins, and Leela, who gives you information and the mound key for the Prince-Ali Rescue Quest. All of the NPCs inside of the jail are part of the Prince Ali Rescue quest. Also, to the side of the jail, you will find nettles (use gloves to pick). The nettles available are used for Nettle Tea involved in the Cooking skill. The willow trees here are well known for their closeness to a bank and availability to everyone, freeplay and members. 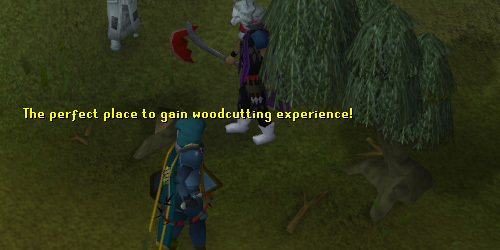 You can always find players cutting there. Many people there can be considered as low leveled, therefore you should be concerned about the level 7 wizards that dwell there. Nearby, there is a obelisk to renew your summoning points, as well as a level 33 Black Knight. There is a Summoning Obelisk a few steps from the willows. These obelisks are useful in restoring your Summoning Points, and they allow you to create scrolls and pouches. 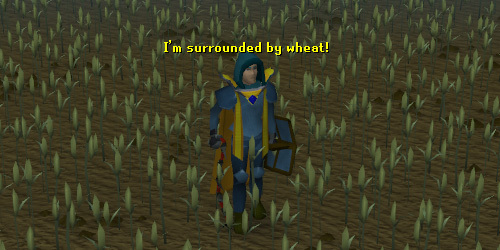 This is the field of Draynor Village. Here you can pick wheat for Cooking (which can be made into flour at a nearby mill). You will also find here a farmer as well as his shack. This is Ned's home. He is located inside and can prove to be very useful on your adventures. 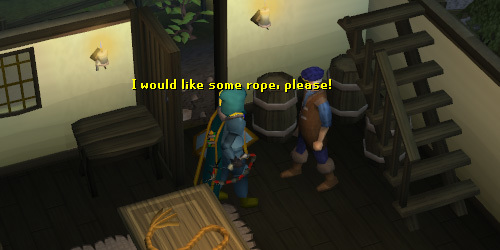 Ned can make rope for you if you give him 4 balls of wool and 5gp, or if you just want to buy it, pay him 15gp. He also will take you to Crandor duringThe Dragon Slayer Quest. He helps you obtain a wig in the Prince Ali Rescue Quest. Aggie is the witch of Draynor Village. She will make you dyes in exchange for various items. 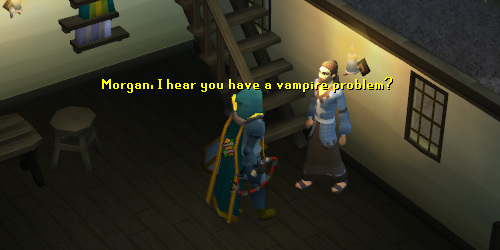 Morgan's house is where you start the Vampire Slayer Quest. 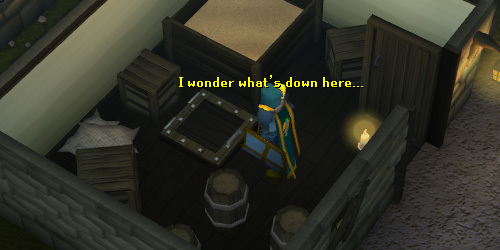 Upstairs, there is a cupboard with garlic inside in it (used in quest), as well as a level 2 Woman. This is Diango's workshop. The main workshop (the basement) is below. If you were involved in the Christmas Event of 2005, then you will find 2 different colors of which are the opposite of the marionette which you currently have. 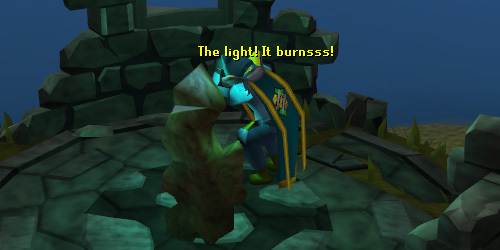 If not, then if you were involved in the Halloween Event of 2006, you were sent inside the actual workshop. 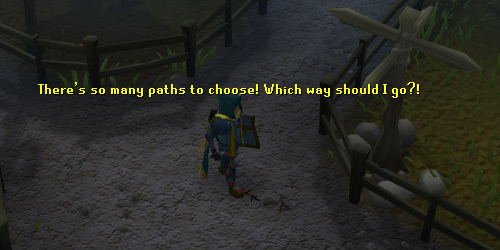 A ways from Draynor Village you will find a signpost at a 4-way intersection leading to Falador, Draynor Manor, Draynor Village, and the fields of Lumbridge. A level 5-highwayman can be found there. 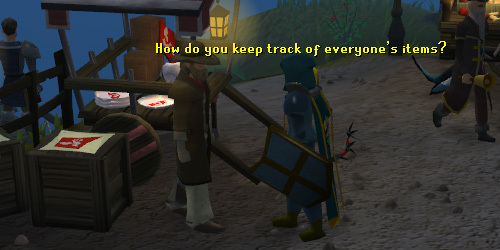 Wise Old Man is very well-known for the infamous Draynor Break In. This old man can be very helpful throughout your adventures. Items are found inside of the shelves, as well as his books. Upstairs there are various items belonging to the Wise Old Man. Talk to the Wise Old Man about lots of things. He will check your bank for items, tell you stories of when he was young, tell you of great adventures, and engage you in a long argument about his stolen party hat. This man will also sell you a quest cape and hood for 99,000gp after completing all of the quests. He will also appear in two quests: Garden of Tranquillity and Swan Song. 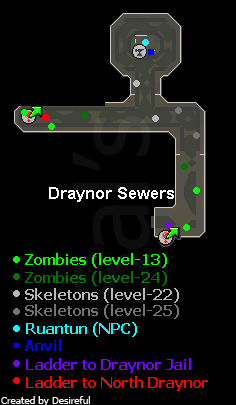 The Draynor Dungeon is a dungeon next to the Draynor Jail. Beneath the trapdoor leading to the dungeon contains various leveled skeletons and zombies, an anvil, and an NPC that helps in the Desert Treasure Quest. 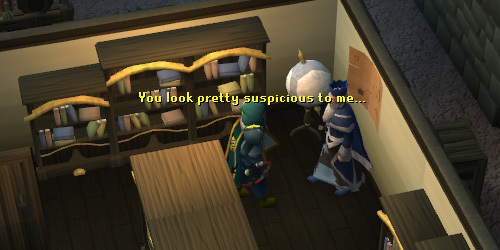 Everyone knows about the Draynor Break In. It was a day of mischief for the Wise Old Man, and achievement at the end. 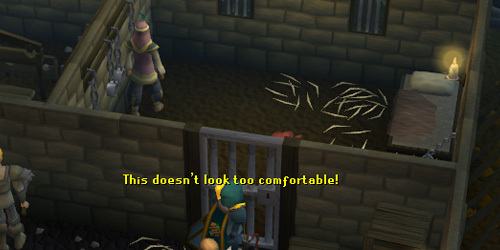 If you want to see the video for the Draynor Break In, talk to the Jailer who is always walking around by Draynor Bank. The next time you want to see it, it will cost 50gp. Martin The Master Gardener is considered the best farmer in the land. He will sell you a Skillcape Of Farming once you have achieved 99 Farming. 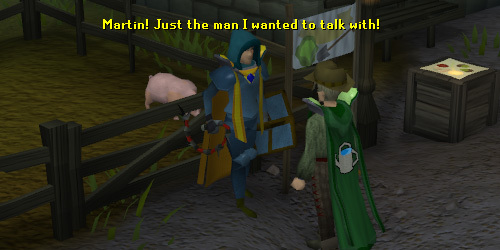 Many people have been known to trap Martin into his pig pen, which makes it a lot easier to steal from him without him running around. Level 38 Thieving is required to pickpocket from him. This shop is owned by Olivia. She will buy and sell specific seeds for a fare price, but you must not have stolen from her stall recently for the past ten minutes; otherwise she will call the guards on you at specific places at the ground. She will also start Fairy Tale Part 1: Growing Pains and Fairy Tale Part 2: Cure A Queen. 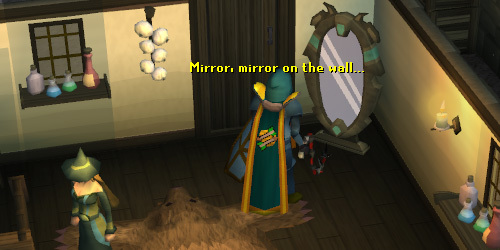 Diango's shop is a very interesting part of Draynor Village. His shop includes toy horses, spinning plates, and dragon kites. He will also gladly return holiday items that were lost recently, disregarding the items from 2001-2002, eggs, and random event items. The wine shop of Draynor Village is owned by Fortunato. 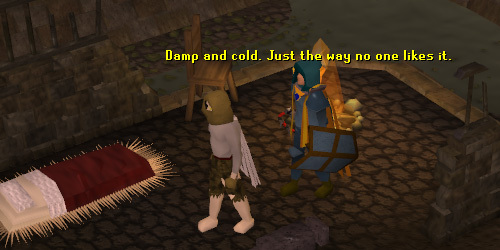 Fortunato can be of assistance to you in the Rag and Bone Man Quest, where he will sell you Vinegar for 1gp. He will sell you Jugs, Wine, and Bottles Of Wine. His stall is also available to steal from. You can steal numerous things out of the table of jugs. 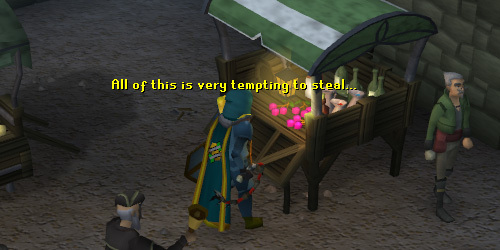 The Thieving level required to steal from Fortunato's stall is 22.